Bellafire Farm is a small little "farmette" located on 1/2 acre in Yamhill County, Oregon. We are conveniently 45 minutes from Salem, Oregon and 1hr from Portland, Oregon. Our small little herd is raised right here inn our backyard. One on one attention everyday :) We pride ourselves on raising top quality ADGA registered dairy goats. We show in ADGA Goat shows & 4H shows and complete an official ADGA Linear Appraisal of our goats each year. In 2019 we will be participating in ADGA & DHI Milk Testing program, which officially tracks how much our girls milk and also the overall health & quality of that milk & of the doe herself. About our goats and babies: Our goats are maintained with the utmost care and dedication to their well-being. Our adult goats (even our bucks) are gentle, affectionate, people-oriented animals. They are wonderful, loving "family members" first and foremost, and we strive to have them succeed as top quality show animals too. Our adult animals are tested free of CAE, CL, Johnes, Q-Fever & Brucellosis. We maintain a disease-free herd using strict bio-security measures which allows us to produce exceptionally healthy, happy animals. 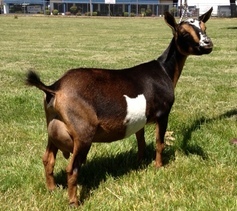 Purchasing a goat: I offer discounts -see the Breeding Page and Sales Page for more info. It's VERY important to me that these well-bred animals go to loving homes where they can show their true potential! If you are interested in purchasing an animal; a $50 non-refundable deposit will hold a kid of your choice until it is ready (approx. 4-8 wks old). A $100 deposit will hold an adult until transportation is arranged (transportation must occur within 14 days). Please check out the current 2019 Breeding Schedule for upcoming 2019 kids. * You can also view our updated Sales Contract, which must be filled out, signed, and returned before any goats leave for their new home. Updated Sales Contract can be seen & printed here. *~* Please review our "So You Want A Goat" page , our "Goat Basics" page, and our "New Goat Owners Pages" before putting in a reservation. These pages were designed to help potential buyers understand the basics of goat care. It is extremely important to me that buyers are making well thought out & educated decisions when purchasing one of our goaties :-). LOTS of love, attention, and care are required to raise a happy Bellafire Farm goat. In an effort to keep our herd as healthy as possible, we maintain very strict biosecurity here and do no allow visitors in/around the goats. 2/11/2018 - ADGA search revealed that CONGRATULATIONS ARE DUE FOR ALETHIA JD BACHELOR PARTY+*B! BP earned his "+"
After taking a few years off due to work & family life...we have hit the SHOW RING & the MILK PAIL again WITH HAPPY RESULTS! BEGINNING NOW - In order to PROMOTE the foundation animals that I STRONGLY believe in and to further promote our Bellafire Farm offspring that live in new happy herds... I have decided to start a CASH BACK prize program to encourage owners with our Bellafire Farm goats and/or offspring from bucks used in our herd to strive for the "Big Winners" and "Big Milkers" in both the show ring and in milk production! ** Option 1 = I will send $50 back to any owner that wins an official Grand Champion ADGA Leg on any junior or adult animal that is in the Bellafire Farm herdname OR is out of a buck used at Bellafire Farm (Bucks such as Goldenbrook Farm Firework, Rosasharn Decoroso *B, Alethia JD Bachelor Party *B, Algedi Farm Buck Rogers, Castle Rock GN Gran Torino *B, Poppy Patch Honey Ima Hottie, & others). This means that EACH ADGA leg you earn on a Bellafire Farm goat or offspring from one of our owned/previously owned bucks wins you $50!!! If a Permanent Championship is completed I will send an ADDITIONAL $50!! That's $200 in your pocket for completing a CH on a Bellafire Farm goat!! ** Option 2 = I will send $50 back to any owner that completes a full ADGA milk star by either One Day Milk Test OR thru other ADGA DHI Program options. Please email me if you would like information on signing up for DHIA through ADGA. It is NOT that hard to do, but you must be dedicated to milking twice daily, tracking your doe's milk production through DHIA paperwork and (at minimum) monthly testing by a licensed tester in your area. It is not difficult to do milk testing, but it does require commitment and dedication on your part to ensure your doe can earn that star! YOU CAN WIN BOTH OPTIONS, MILK & SHOW!!! I ENCOURAGE YOU TO DO SO!! To Jennifer of Hidden Hills Dairy Goats, and GCH Bellafire BP Country Melody 1*M who earned her AR milk Star as a first freshener in volume, fat and protein! This is quite an accomplishment for a first freshener! To Jodi of STAYAWHILE FARM on the great accomplishment of earning milk stars on BOTH Bellafire BP Winter Wedding 7*M AND her dam Bellafire WH Against All Odds 6*M!